01. The colour of this dress just screams summer! Simple but extremely appealing, and with the right accessories, I think this could be the basis for a killer outfit. Yummy! 02. After drooling over the new Polly bags in Selfridges a couple of weeks ago, I have rather fallen in love with the style and ‘pumpkin’ colour sported by the style! I concluded that, having bought a Mulberry Neely under a month ago, it would be greedy of me to be lusting over the bag itself; so since I haven’t bought a new purse in nearly 4 years I thought I would allow myself to drool over this one instead! 03. These amazing leopard print platforms have been on my radar for over a month now, and I ADORE them. There’s no chance of me making a £70 purchase at the current time, but it doesn’t hurt to dream. These are my perfect shoes! 04. I love crazy jewellery, and I actually used to have a plastic goldfish ring when I was at school, I seem to remember… or possibly a keyring. Either way, this got me feeling all nostalgic and feels to me like a more ‘grown up’ version (as grown up as you can be, wearing a goldfish ring, anyway!) I’m in love! 05. I’ve been on the lookout for a deep, darker shade of red lipstick to try out for a while, and Diva by Mac seems to be screaming to me at the moment. Perfectly vampish, without being full on ‘goth’, this seems to be a shade that could bring out some serious Femma Fatale attitude! 06. Butler & Wilson… oh they’ve done it again! One of my best friends actually owns this necklace, and being the magpie I am, I’ve had my beady eye on it ever since the first time she showed it to me. I’m dying to get my hands on one for myself! I love my jewellery over the top, seriously sparkly and a little bit tacky, so this is perfect! 07. Because who wouldn’t want to spend the summer months looking like a glam 70’s goddess?! 08. It’s actually kind of ridiculous how delicious this perfume is. So heavenly! Ever since my run in with a sample in a magazine during my first year at university, I’ve been hooked! Unfortunately, I ran out a few months back, booo… so it’s only a matter of time before a new bottle takes pride of place on my dressing table! I am definitely in lust with that yellow dress! It is such a gorgeous colour! love the fishy! so cute. I love that yellow dress, i think it would be perfect for work wear! Oh man, I want it all too! 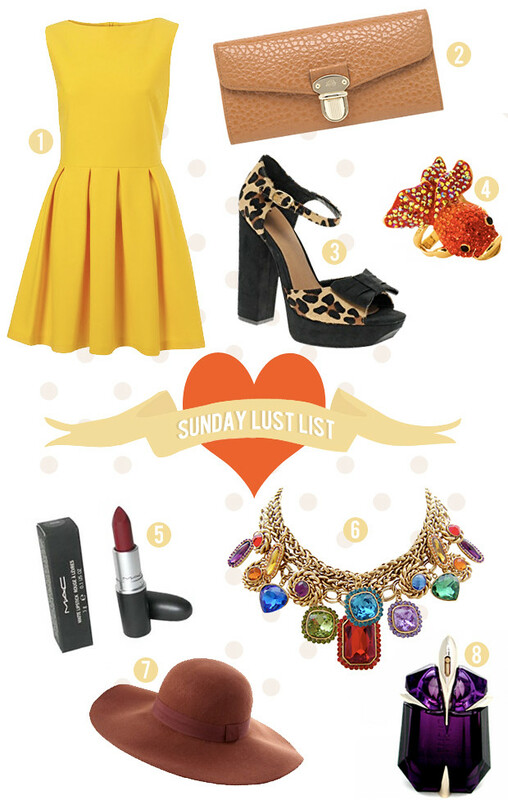 That goldfish ring is just too amazing, and I’m glad I’m not the only one with a penchant for leopard print heels – these look fab.